Well, now that the Super Bowl is over, the NFL calendar flips once again toward the Combine, Free Agency, Draft, OTAs and the new coaching systems about to start on several teams. 2018 left some interesting loose ends. A few of the items mentioned here are perhaps premature talking points before we get to the free agency contract expirations on March 13. However, several important players are going to play a major role for the composition of several teams come this summer. The problem with trying to discover the new face of teams with player changes is that the statistics we compiled in the previous seasons become less reliable for projecting what comes next. A good example of what I’m talking about is a guy like Robert Woods of the Rams. He languished helplessly in a Buffalo system for four seasons until he finally broke out with McVay’s Rams in 2017. Some things we can foresee. Take Jordy Nelson. We saw what happened to Greg Jennings, a two-time pro bowler with a fine career in Green Bay. The decline of Aaron Rodgers‘ former number one receiver after he went to Minnesota caught many out by giving Jennings an inflated ADP. Once stung, we applied the same thinking to Nelson when he left for the Raiders and the result was more or less similar to Jennings. So, after this Super Bowl, and our long since gone fantasy championships, what next? Some guys have a large part to play as a fresh 2019 season rumbles down the road to next September. We’ll likely find out next month where Nick Foles ends up. And that matters big time for our fantasy forecasts. Miami, Jacksonville, Denver – even the New York Giants are among several teams ready to sign Foles. We’ve seen enough of Nick Foles to know his capability and it stacks up pretty darn good considering the weakness of the position on several teams. Foles has his flaws. Over-confidence in his reads of defenses and standing up to blitz pressure are two that stand out to me. Yet Foles has something every coach loves – he’s a gamer who comes on the field selflessly for the team. No wonder the Eagles loath the idea of parting ways with the hero of Philadelphia. That’s another thing too. He is a locked-in legend with the fans. The Eagles exercised the $20m option on Foles, but Foles himself voided it with a $2m buyout. The Eagles still have franchise rights and have until March 5 to tag Foles; thus opening trade shopping for the team. Foles, depending on where he lands, will range somewhere from low QB1 to high QB2 I suspect. Definitely draftable, but I somehow can’t shake the feeling of Foles as a matchup streamer – rather than a quarterback you start each and every week. Of course, much depends on where he plays and a system we can see him comfortable in. Overall, Foles raises the value of pass catchers on his next team and all eyes should focus on who he tends to favor in OTAs and camp. So watch especially for whatever news comes out on that front. Hopefully, we can cut through the eventual hyperbole and get an idea of what Nick Foles version 3.0 can deliver in 2019. Not many quarterbacks of our era can boast of winning more than one Super Bowl with Tom Brady around scooping them. Only Eli Manning and Ben Roethlisberger are the other active multiple winners in the 21st century. Yet Eli Manning rides more on his laurels than solid play throughout the years. In 2018, we had to examine if he actually started harming the production of Odell Beckham Jr. in fantasy. Yes, OBJ went beyond 1000 yards, but the week to week production remained erratic. He found the end-zone six times; which is about half the total we’d normally expect from him in a season of full health. It turns out that 2018 was more or less a typical season for Manning. Five 300+ yardage games was more than Dak Prescott could ever get close to. So, why the OBJ dip? The answer is Saquon Barkley. Barkley was the second most targeted (121) by Manning after Beckham (124). Now, we really don’t care about what OBJ did, because what’s done is done. If Eli Manning plays another full season, then we simply adjust our projections for OBJ and other Giants by taking Barkley with better consideration by putting for par on the emphasis. Like we always do. Well, the problem is, Eli’s 2019 with the Giants isn’t so secure. We may be looking at a successor to Eli and in perhaps a fashion as we saw Joe Flacco move over for Lamar Jackson. 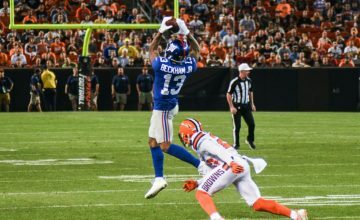 This is a situation where what the Giants do in the draft will tell us much about what 2019 has in store for Eli and the pass-catchers on the team. The latest on Cam Newton’s recovery from shoulder surgery (which turned out to be a clean-up of scar tissue) is better than initial expectations. We have to bolster our confidence with some caution as shoulder injuries can play nasty tricks with optimistic outlooks. We went through that with Andrew Luck, remember? The good thing is, we’ll be able to gauge the true nature of things with whatever participation Newton does in the off-season team activities. Time and again we were told by Sean McVay and others there was nothing wrong with Todd Gurley’s knee. So he played in Super Bowl LIII, but where was the effectiveness? Although the rest from Week 17 and the playoff bye-week propelled Gurley back into something of what we saw throughout 2018 against the Cowboys in the divisional, CJ Anderson still out-carried Gurley by a 23 to 16 margin. Beyond that, Gurley’s patented unstoppability disappeared against the Saints and Patriots. It has everyone baffled. Now we have to wonder if there is a lingering knee issue that McVay just didn’t want to open up about – or something else. If it’s something else, then we’re in some uncomfortable territory with Gurley’s fantasy value. We do get backs who dramatically drop off following a strong season. CJ Spiller and Doug Martin are unfortunate examples of that. I like to think Gurley is different, and I do, but man it’s tough to rule anything out if Gurley’s knee is okay like he says it is. So we’re alarmed about it. And we should be. Suddenly Gurley seems like a risky first-round pick in comparison to how confident we were having him as a lock first-off-the-board draft choice entering 2018. We probably need to read between the lines of Gurley stories in 2019. Above all, remain optimistic. Gurley will obviously desire to put everything right. It’s a mess. The Steelers can put a “transition tag” on Bell, which is similar to a franchise tag. This would allow the Steelers a chance for a trade. However, the idea seems pointless. First of all, by tagging Bell, you are basically saying “we want to keep this player and are willing to match all offers if the price is right” – which, of course, they don’t. The only thing that works for Pittsburgh is they get one last chance (a week or so) to hammer out a deal with Bell on their own as the sands run out and the offers stream in. The Steelers also lose out on a compensatory third-round draft pick if they fail to match another team’s offer. Basically, Pittsburgh fills up their gas can with holes in it, hoping they can get to their broken down car a mile away in time before it all leaks out. They are best just buying a new can while at the service station and chucking the old one in my view. As for Bell, we have to accept the fact he won’t play for the Steelers ever again. Do we automatically consider Bell an RB1 wherever he goes? I’m not so certain I could use a first-round choice on Bell. Different systems mean different expectations. Good running backs never seem to just plug ‘n’ play on a new team without missing a beat. Marshall Faulk is about the only one I can think of. The Ravens would really liven up 2019 for the Pittsburgh-Baltimore rivalry. If Bell goes there, and considering the run-first offense Harbaugh has concocted, we could have better confidence of seeing a Faulkesque resurgence. Another headache for the Steelers. Antonio Brown is not happy with Ben Roethlisberger, Mike Tomlin, and the Pittsburgh organization as a whole. He has even more on his plate with an on-going custody battle – a case which is totally messed up. 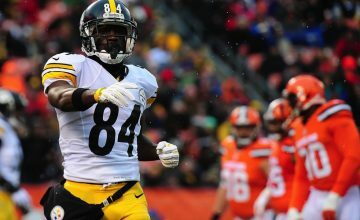 Brown turns 31 in 2019 and while that might not mean too much for his skill level, the Steelers can’t expect lucrative trade value for one of the best receivers of the decade. If you add in his recent baggage of domestic problems – it adds up to one big sigh. 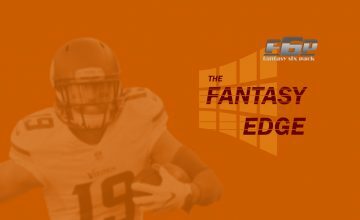 So Brown is on fantasy watch in 2019 and dynasty traders may have missed their chance to unload while the heat was on low. On a different team, we might have to scale back that ADP – even possibly outside of WR1 territory. 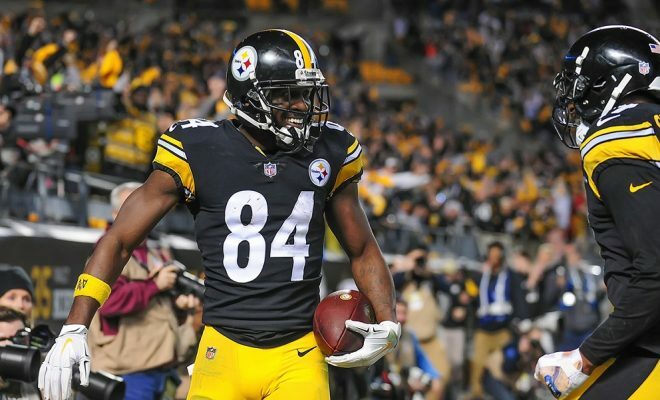 The Ben-Antonio combo is unique and we are hard pressed in fantasy to expect this 10 year veteran receiver to make a wholesale adjustments. Especially if he signs on to a team with one of the younger quarterbacks. One luxury I get in writing about Kareem Hunt is that I don’t have to rake over details of why he’s in the spot that he is. What matters at the moment is what kind of suspension comes after the investigation hands down the report to the league. This should arrive before free agency begins next month. Several teams have interest, including the Chiefs of all teams, who released him in the first place. Again, his placement and suspension duration have a direct bearing on fantasy value. However, considering how well Damian Williams carried the ball with the Chiefs after Hunt left, the Chiefs offensive line and how they are coached speaks louder than Hunt’s talent.